I had a plan for Little Man’s dinner the other day. I was warming up a very yummy (I thought) cheese sandwich in the toaster oven, but he was hungry right now. So I put him in his high chair and gave him some of the cheese puff things that I usually reserve for bribery to get him in and out of the car seat after many errands or in case of lack of nap. And now I gave him those delicious, and of dubious nutritional value, snacks before I actually gave him any real food. Big mistake. After munching on these processed and addictive snacks (to be fair, they are made by a respected baby/children’s food corporation, but I still don’t trust them), there was no way that Little Man was going to touch actual food. Uh-uh. Don’t think so. No way. This led me to think about my lack of strategic planning at feeding time. I’ve lost a certain level of commitment to crafting a scheme to feed my toddler. It’s not that I support mommies being short-order cooks (not that Little Man can make requests, he can merely voice his displeasure or whine for some hopefully discernible item), but I do believe in having a plan of attack. When did I lose my motivation for getting him to eat? It used to be that I looked at meal time like a challenge. Let’s see how much I can get him to eat, you know? But now, I’m just halfheartedly putting food on his tray, hoping that he will actually consume it instead of playing elaborate toddler games (like see-how-far-the-cereal-will-fly-when-thrown game and the how-loud-of-a-noise-will-the-spoon-make game). I think that because of his waning interest in eating, I have a waning desire to sit there and continually try different options. For instance, Little Man likes a certain amount of variety. Just because those frozen mini waffles were a hit the past three breakfasts does not mean that he is going to want them today. No, in fact, it probably means that he won’t want them. Even with maple syrup. And the Cheerios with milk that he was crazy about? Give it a rest for a few days. Bring back some of the old favorites, like scrambled eggs, or maybe toast with jam. Also, pay attention to his cues. He grabbed a banana off of the table? That might mean that his banana strike is over and he once more wants some potassium-filled yumminess. But leading with the cheese puffs? Bad move, mommy. Nothing really follows junk food. Like I said at the top, I had a plan, but it just wasn’t a good one. Ah, but it could be a fun challenge. I need to reframe this particular parental duty in a more appealing light. I need to be prepared. Be crafty. Be innovative. I’m starting with lunchtime today. Assuming he actually wants to eat, that is. This time, it’s business. I will have a variety of carbs, fruits, and veggies. They will be ready, on call, eager to serve in the quest to feed Little Man a respectable meal. I even got some creamy peanut butter (the crunchy was a flop). Operation Feed the Toddler commences in t-minus 15 minutes. Thanks Heather! Moshe also displays a certain “I want what’s on the table” attitude, which would be nice if he actually ate them once I give them to him. It’s so hit or miss. It’s nice that your husband is accommodating to the twins’ eating behaviors! I love your blog and your writing style. My wife and I are expecting our first child and I am planning on looking back over your blog entries for first time parent tips from time to time. Love it, Rivki! Wow, this makes me a little nervous for toddler-hood. My baby is so docile in comparison. And all she eats is milk! Congrats on the move to your new address (online, of course). I don’t understand (remember, I have a baby, not a toddler…)- doesn’t he get hungry if he doesn’t eat? Don’t be nervous – it happens pretty gradually. I figure that he does get hungry, but I think the desire to play outweighs the desire to eat. That’s my theory. So I ask him, “Are you hungry? 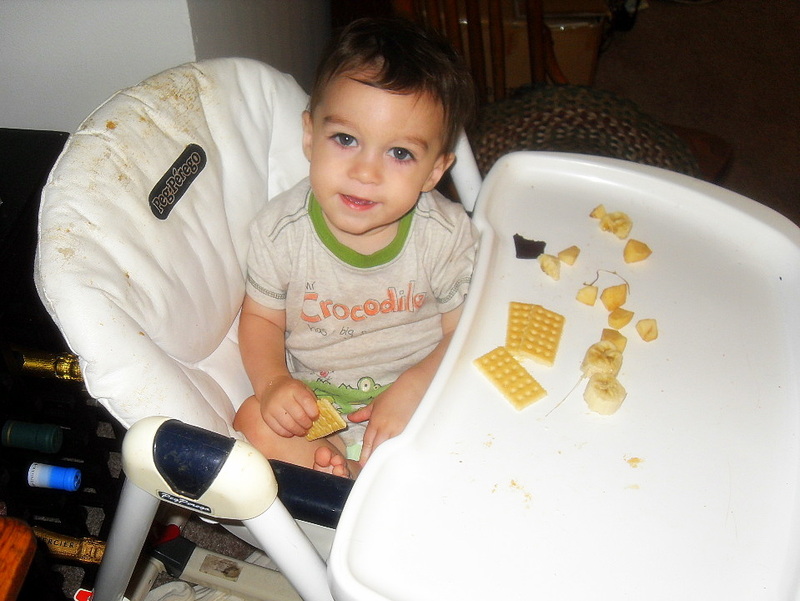 Do you want to eat?” and if he is/does, then he goes to his highchair. Or sometimes I wave some food in front of him and that reminds him that eating is good.